This fingerprint lock has the security of a traditional one with added intelligence and convenience. 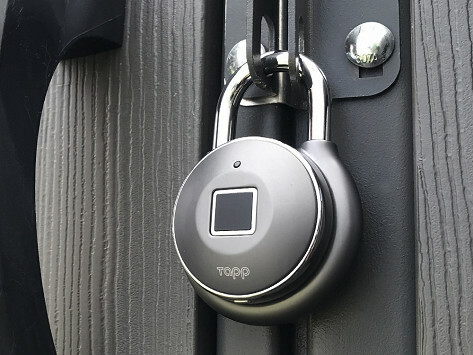 It unlocks in a less than a second and in three different ways (directly with your fingerprint, by programing a tapping rhythm, or via the connecting app). Use the companion app to check the battery life, the entry log, and grant or revoke access to individuals whenever you like. It is anti-shim and anti-pry, too. Dimensions: 3.4" x 2.2" x 1.34"
I've only had this lock for a short time, and so far it's been great. I like not having to remember a combination or keep up with a key. This lock is working perfectly. It is (almost) everything I wanted and expected. I use it to secure a firearm I don't always keep in my safe. The only thing I'd like to see done differently is to incorporate the small bottom button into the fingerprint reader. I'd like to be able to rest my finger on the reader pad and push/click the pad to activate the lock. I'm envisioning something like my iPhone. As it is, opening the lock is a two-step process - push the small button to wake the lock, and then reposition your hand to rest you finger on the pad. I'd like to see this reduced to, rest your finger on the pad and click while simultaneously reading print. Now unlocking a secure lock is even easier, without sacrificing safety.